Unfortunately they come with a hefty price tag. The few that have made their way to online stores range in price from $295 to a whopping $2,995 (YAOW!). I am going to wait to see what other variations come out and then I'll make my decision. This is pretty easy to DIY, but I am not as crafty as I once was. But we'll see. 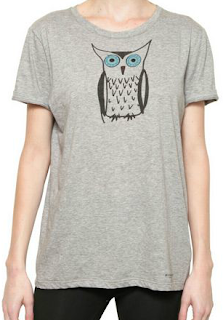 Either way I WILL own an adorable owl tee or sweater! 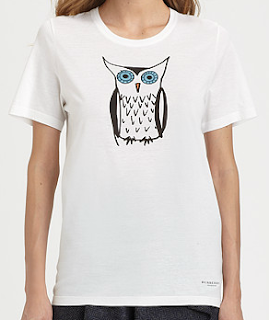 Burberry's website has a bunch more available as well, check it out! There are even male versions, so you could get a small version of one of those! These are so cute, I love the gray one!! I love your blog and just started following! Check out mine!! 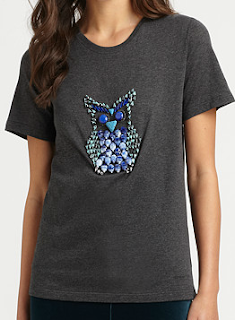 i like the beaded owl on the sweater, the screen printed owls to not merit that price tag, and the beaded owl on the tee clearly weighs too much since he is pulling down the shirt. worth that price tag? no way. i'd rather have a new bag or pair of shoes for $300. New post on my blog too, check it out and let me know your opinion! 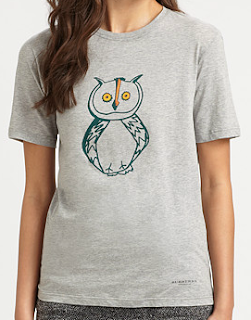 Love the owl design. Have you seen anything cuter? But yes, the price tag is jaw-dropping. The two you like are pretty sweet. Since you don't want to DIY you may find someone else to on Etsy. i love the shirts and sweaters...and love the one with the beads as well!! you know what I'm thinking??? DIY lady!